farms of sympathetic Quakers in the southern part of the county, from the Susquehanna River near the Maryland Line that also extended into Chester County. In spite of some semi-primary sources like R. C. Smedley's 1883 History of the Underground Railroad in Chester and the Neighboring Counties of Pennsylvania and research efforts like Charles Spotts' 1966 pamphlet The Pilgrim's Pathway: The Underground Railroad in Lancaster County, which named seventeen "stations" in Lancaster County, our knowledge of the fugitive slave activity in Lancaster is fairly limited. What might actually be our best glimpse into what was going on in the minds of fugitive slaves and the people who harbored them is an 1873 novel by Ellwood Griest entitled John and Mary: or, The fugitive slaves. 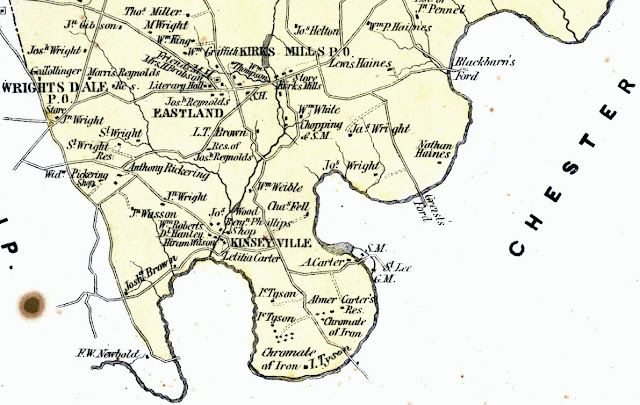 A tale of south-eastern Pennsylvania (click on link to view the book). Maj. Ellwood Griest (1824-1900) was born to a Quaker family just across the Octoraro Creek from Lancaster County in West Nottingham, Chester County. He learned blacksmithing, moved to Christiana, and became very active in Republican politics and abolitionism. The Lancaster Intelligencer even accused him during the 1860 election campaign of "figuring somewhat prominently" in the Christiana Riot, although I haven't seen evidence. Griest also served with the Union army as a Sixth Corps commissary officer (a Quaker compromise? ), and stayed in the army until 1866 witnessing early Reconstruction in Florida. After the war, he ran a newspaper in Lancaster and stayed active in politics. Lancaster's 1920s skyscraper, the Griest Building, is named after Ellwood Griest's son, Congressman William Walton Griest. This remarkable novel is actually a rather interesting read, and combines fiction and fact (some autobiographical) to tell two stories. The story was set very specifically along the Octoraro Creek in this area. The first is set in 1830 along the banks of the Octoraro Creek in Little Britain Township, Lancaster County, near the Maryland line. A Quaker family, the Browns, get involved for the first time in hosting fugitive slaves--John and Mary and their infant, Charley--but the plan for their northward journey is thwarted, resulting in a semi-dramatic nighttime confrontation with the slaveowner's posse. The second story is set in late 1865 or 1866, and takes place during early Reconstruction at an army camp near Gainesville, Florida, where one of the Brown children who witnessed the events of 1830 is now a captain. An act of racial violence linked to the Ku Klux Klan meant to intimidate the black soldiers stationed there leaves a soldier of the 33rd Regiment, United States Colored Troops, dangerously wounded. Capt. Brown meets the ultimately fatally wounded soldier and the soldier's mother, recognizing them as the fugitives he met as a six year-old boy. Many characters of the story are connected to and presumably buried here. Griest mentioned many free black men from Lancaster and Chester County joined the 33rd USCT. In spite of attention given to heroism displayed in 1830, the story imparts a rather pessimistic message about Reconstruction. The fugitive slave baby, whose life was so treasured and precious that so many people in 1830 risked so much to save the baby from slavery, grew to a man whose life was ended rather meaninglessly by random racial violence in the post-war South. Griest's assessment seems to be that this sort of violence was undermining Southern society. He might have also been responding to similar sentiments (although not as violent?) in the North--even Lancaster--as the Democratic Party of the late 1860's made a pretty nasty brand of racism into a policy pillar. Here's an interesting poem from the September 24, 1870, Columbia Spy in which an anonymous (presumably) African-American author expresses deep exhaustion with the grip racism has on society. If you encounter any interesting passages in John and Mary, or something in the books strikes you, feel free to share in the comments. "Banking on the Octoraro," Lancaster Online October 3, 2008. Efforts of the Lancaster County Conservancy to preserve land referred to in the story above.